How to do an Ollie on a SkateBoard for Beginners? The ollie is the foundation for most skate tricks. That is why most skaters start by learning how to do an ollie on a skateboard. Having a skating teacher is not always possible and learning by watching provides unsatisfactory results. Ollies are performed quickly and require specific foot placement and action that the human eye may not be able to track. Learning the correct Ollie is stressed because it is the fundamental building block used in more advanced tricks. If you perfect the Ollie, you will set yourself up for success with more difficult tricks. How exactly does one perfect the Ollie? The first step is always proper foot placement. That is the easy part. Next, you need to practice the body movements required to gain upward momentum. Finally, you must master proper execution of the jump and landing. Foot placement of an ollie seems stupid simple. It is important to talk about still. Simple mistakes make performing an ollie more difficult than it should be. 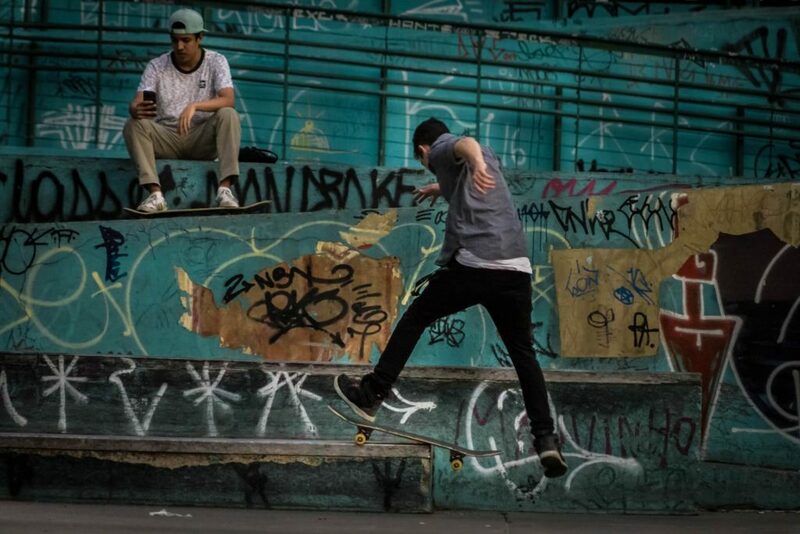 For starters, it is essential only to use the front half of your feet while preparing for an Ollie. You should not have the entirety of either foot flat on the skateboard until after you land the trick. To ensure you can create enough upwards momentum, your back foot should be placed on the back tail of the board. You should put your front foot slightly behind the truck. If your front foot is too far forward, your board will never leave the ground. If your front foot is too close to your back foot, your board will be difficult to control in the air. As you prepare to perform an ollie, you will need to create some upward momentum to get the board off the ground. Before you can do this, it is vital to get low to the ground by bending your knees and crouching down. You will have to judge the height of the obstacle you jump (if any) and base how far down you crouch off that. Everything up to now is perfect. You have the foot and body positioning. Time to perform the trick. To launch the board upwards, use the back foot to push the back tail of the board downwards. This will bring the front end of the board upwards. It is not so easy to lift the back end of the board. To do so, you need to jump upwards with your entire body. It is important not to push downwards with your back foot to the point where you are trapping the board between your foot and the ground surface. You need to release some of the pressure before the tail hits the ground if you want to jump off the ground rather than stick to it. Now you almost know how to do an ollie on a skateboard. Your board is in the air. Time to stick the landing. As soon as your board leaves the ground, raise your front foot to catch the front skateboard tail. At this point, your feet should be spread apart with one on each tail. As you reach the peak of your jump, you want to move the board with your feet so that the board becomes parallel with the ground surface. This needs to be done before you land. If you lean too far forward or backward, there is a good chance you will fall off the board when you hit the ground. 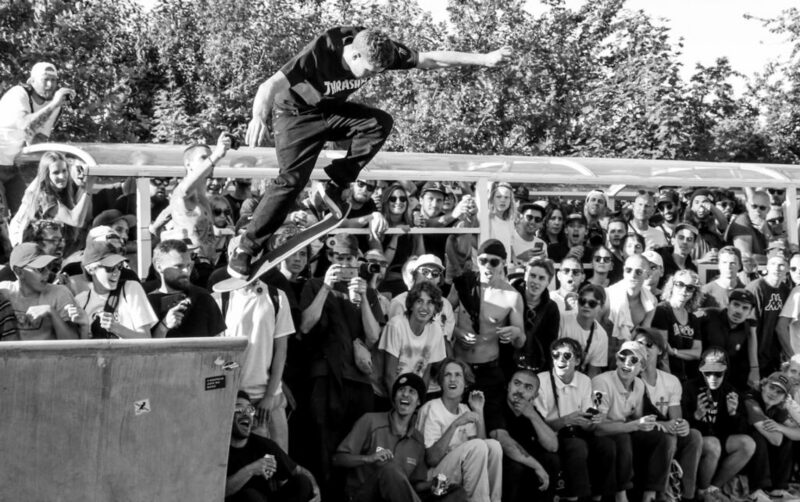 Now you have everything you need to perform the perfect ollie. Master this trick, and you are well on your way to learning more complex ones. After all, the kickflip is just a modified ollie.